So i'm in a heated blog-o-tion with Mr. Mini-Soldiers. Painted soldiers are due by the fifteenth of September. And because that clean shaven, gingery villain has me beat in not only raw talent, but has achieved super speed (he cheats and uses an airbrush), I legit my work cut out. I'm going to push my self and try to paint my best model to date, my precious being this Angron which I was pretty stoked to get a first cut at the last Memphis Games Day. 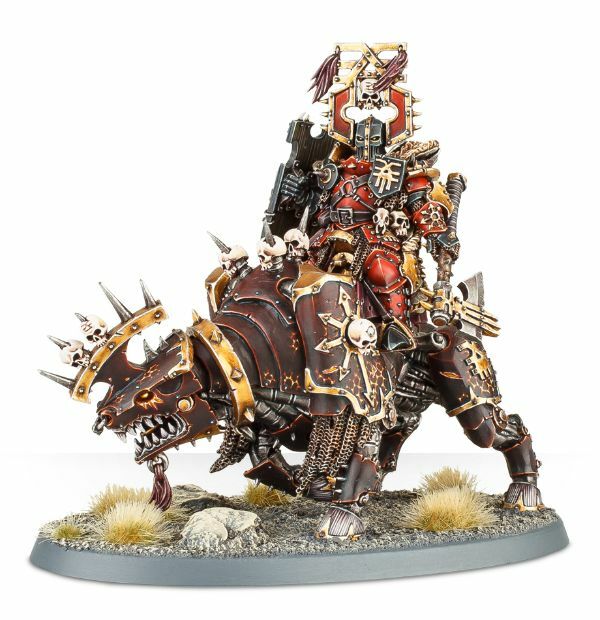 I m not very imaginative so I 've decided to emulate the 'Eavy Metal paint scheme pictured here. I love the two different reds. I've enlisted ace painters Tim and Matt as technical advisors and they've already given me some pretty helpful advice some of which I 'll be sure to use. I'm painting the model in three parts. First the Juggernaut, second the rider and finally the base. So without further ado here is the Juggernaut. I'm still not great at taking pictures so any advice on that front is welcome. This is the first time I've tried glazing based on Matt's input, not sure about the finished product. Tim helped with the color selection. This is the second time I 've attempted zenith highlights and I m not sure it's going to be enough to beat Mr. Mini-Soldiers without a lot more work. next step is to bring him around and get some feedback about what to improve, once changes are made I will post an update. Bugger you are doing really well, I am going to have to pull my finger out and get my model done. I think you might win this one! Only with a lot of help and some favorable wind.